It is hard to find English information about Cameroonian football. In the next seven posts I will therefore give a short presentation of the 14 teams competing in the MTN Elite One 2010-2011, the highest level of Cameroonian football. Les Astres FC de Douala, commonly known as Astres Douala or Les Astres FC, is an ambitious club from Douala, the largest city in Cameroon and the commercial capital of the country. Astres Douala is currently fourth in the MTN Elite One 2010-2011, a position they won’t be happy with at the end of the season. From my point of view, Astres Douala has been one of the big spenders of Cameroonian football the last couple of season, but the club has yet to bring home the title. Lawrence Ngome (born 23.02.1979) and Hugo Nyamé (born 13.04.1986) are both experienced goalkeepers who are fighting hard to become first choice goalkeeper. Central defender Geremi Sagong (born 20.07.1986) is leading the defensive line and will most likely establish a successful partnership with Ghislain Mvom (born 23.10.1992), a new signing from Fortuna de Yaoundé. Mvom, who played for Cameroon U-20 in the FIFA U-20 World Cup, is widely considered as one of the most talented central defenders in the country. The star of the team is arguably Jean Patrick Abouna Ndzana (born 27.09.1990), a highly gifted right-back who made his full international debut for the Cameroon national football team against Italy on 03.03.2010. Abouna Ndzana will most likely join a European club during 2011. Astres Douala has several talented players, including playmaker Clarence Bitang, presented in my post from 18.11.2010, central midfielder Michel Mvondo, and attacker Akwo Tarh Ayuk Taku (born 07.12.1992), a youngster who was a surprise inclusion in the Cameroon B squad for the CHAN-tournament in Sudan. Winger / attacker Joseph Julien Momasso (born 09.12.1985) is another key player and the leading scorer of the team (5 goals), known for his excellent left foot. Momasso has been training with the Cameroon national football team for the last couple of weeks. Center forward Philippe Ebonde Ebongue (born 27.10.1987 or 27.08.1988) is often the captain of the team and is a prolific scorer in local Cameroonian football. He will not be happy with the three goals he has scored so far this season. Other players worth mentioning is right-back Paul Roland Bebey Kingué (born 09.11.1986), defender Jean Marc Epée Diboundje (born 25.07.1989), who has also been captaining the team, defensive midfielder Nesmen Ndemen Feuleu, winger Roméo Yem Yem, midfielder Brillant Munki Nformi (born 11.10.1989) and attacking midfielder Christian Heumi Kabon (born 01.01.1989). 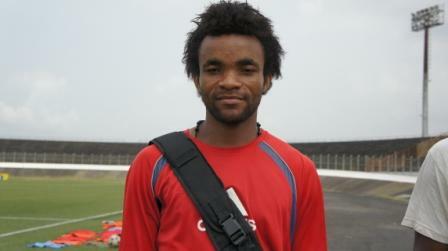 Newly promoted Caïman de Douala is a former top club who has returned to the top flight after many years of absence. The club is currently number 13 in the MTN Elite One 2010-2011 and will have to fight hard to avoid relegation. Fodjo Lali has turned out to be a very promising goalkeeper and trained with the Cameroon U-23 national football team in February. Important defenders include the experienced André Zame (born 16.07.1983), formerly of Cotonsport FC and Union Douala, Mohammed Hassan and former Astres Douala central defender Engelbert Maloka Sone (born in 1987). (born 24.08.1987) are also regular players and have both been featuring as captain of the team, while the youthful Didier Yimga (born 23.05.1991) is a midfielder for the future. Skillful right-winger Issah Mfopou played for Union Douala last season and is now an established member of the Caiman team. Playmaker Mbeleg Inouni (born 08.06.1988) is arguably the star of the team. Inouni was considered for the Player of the month-award for January 2011, but Edgard Salli of Cotonsport FC eventually won. Inouni is the player pictured, a picture taken from Le Chabba. Hopefully, speedy and talented striker Christian Njoh (born 14.08.1990) will find his scoring boots for the second part of the season. He won’t be happy with the two goals he has so far. Njoh made a name for himself at Matelots de Douala in 2009-2010.
hola …me llamo pierre herve amougou …soy el agente de thierry makon nloga ..